A lot of people inspire me, and they’re all badasses. Well, maybe not a lot of people. But if one badass seems like ten people, then we’re talking about a lot of people. “Badass” is in the dictionary. Merriam-Webster says the word’s first known use was in 1955, and all of its definitions are prefaced with “often vulgar.” 60 years later, “badass” is mainstream enough that the preface isn’t warranted, in my opinion. Badassery is tricky to define. It’s more than displaying “formidable strength or skill.” Badassery is also attitude, but to an even greater degree, another part of badassery is a je ne sais quoi that awes and renders anyone’s argument invalid. 1). The fake badasses out there confuse things. 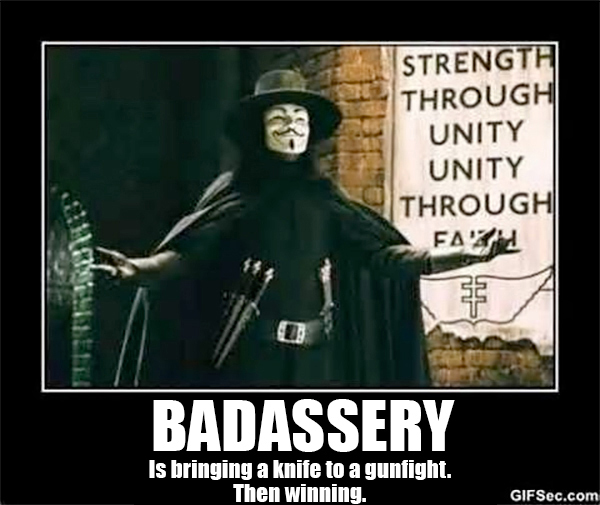 It’s fake badassery (MW’s definition 1) that’s all arrogance, bravado, and swagger. 3). Real badasses don’t know that they’re badasses. If they do, they don’t show it. 4). Bullies think they’re badasses, but real badasses don’t bully. 5). Confidence doesn’t always make a badass, but a real badass can beat an opponent who’s over-confident. 6). Real badassery doesn’t gloat. 7). Real badassery is when you compete with yourself, and if you defeat someone, it’s just because they got in your way. 8). If real badassery causes an accident, it doesn’t leave the scene. 10). Real badassery is beast-mode. It’s giving yourself 100%. 11). Real badassery is imposing your will… on yourself. 12). Real badassery is saying “f*ck you” (to bring vulgarity back into the conversation) with a game-changing action that no one saw coming. 14). Real badassery is winning because someone looked at you and mistook meekness for weakness. 15). Real badassery is looking at yourself and always seeing opportunities – and taking those opportunities – for improvement, so you never stop training, growing, learning. 16). Real badassery is getting up when you’re down and going in for more but knowing when you’ve had enough. 17). Real badassery is not quitting… it’s graciously accepting defeat, then regrouping. 18). Real badassery is focusing on the fight in front of you. 19). Real badassery is beating the odds. 20). Real badassery is surviving, then forging ahead like nothing ever happened. We should have a National Badass Day where we take a moment to thank the badasses in our lives who inspire us to push ourselves toward our greatest potential. Everything else has its day, it seems. Yesterday was National Lemon Meringue Pie Day. Need I say more?